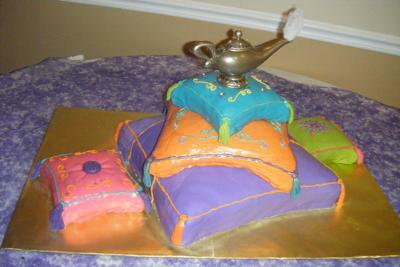 I made this cake for a bride-to-be who was having an all out Arabian Nights bridal shower. She wanted the cake to stand out and it was my very first time making more than one pillow cake. I was a little nervous,but I pulled it off,including my homemade fondant. I chose the bright colors to go with her bridal shower theme, and was lucky enough to find a genie lamp. I embellished it with some color and added a puff of smoke(batting). Guests at the party were asking if the cake was real and they even wanted to touch it. How much did you charge to make this cake? I love this! What a great cake; gorgeous! Join in and write your own page! It's easy to do. How? Simply click here to return to Bridal Shower Cake Idea.